The current issue of Fast Company magazine (December/January 2010) has an interesting article about one of the best known outlets for modern style: Design Within Reach. A Modern Mess: the Rise and Fall of Design Within Reach by Jeff Chu is an enlightening read, and a little disappointing. Maybe I'm just naive, but it was news to me that DWR was knocking off some of their most popular products. Most of this has happened in recent years, but one example dates back almost the to company's founding. 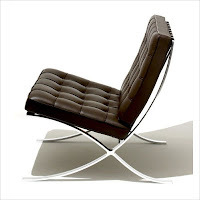 Up until 2005 the iconic Barcelona chair available from Design Within Reach was actually a clone called the Pavilion. "I didn't feel that good about it... It bugged me ... "
Apparently DWR finally got permission from Knoll to sell the genuine article- but the practice of touting design and then ripping off designers has tarnished their image for many longtime fans. To his credit DWR founder, Rob Forbes, seems regretful of that early decision. He told Fast Company, "..it's legal to sell those things, but it's how you go about doing it. We all have our instincts about what you can live with. Some people are happy with breast implants and some aren't." Hopefully the future for Design Within Reach will be less strained than that analogy. I'm skeptical whether they can avoid becoming Pottery Barn Minimalist in today's economic climate. But I'm optimistic they will improve their business ethos, so for now, I'm still a fan. Thanks so much for this interesting read! I was always miffed at what "within reach" really meant, because it didn't seem like it was in many folks' reach! So glad I found your blog this past year, keep up the good work in 2010!